Sunday, February 5, 2:00pm, at the Ojai Valley Community Church, 907 El Centro St., Ojai, California. 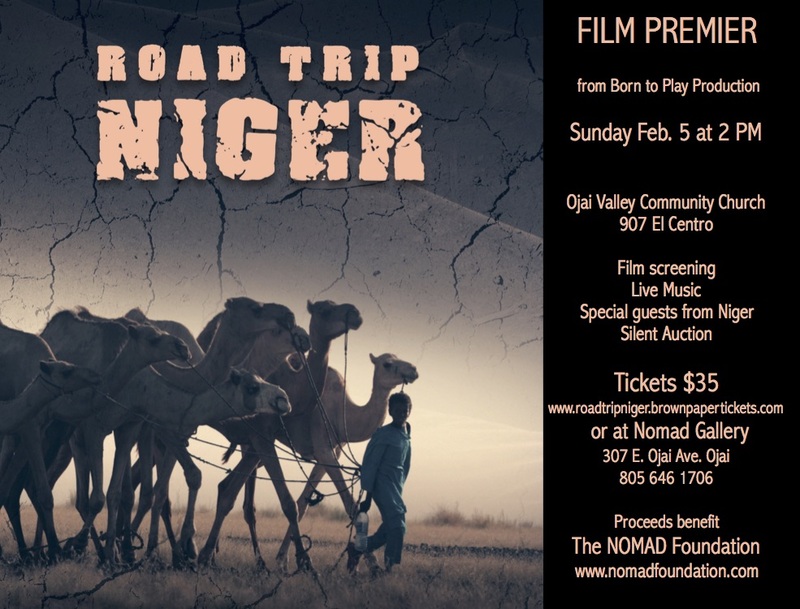 Born to Play Productions presents a film about the adventures of the filmmakers in a country as far from home as imaginable, to discover the nomadic tribes of Niger, the vast, unforgiving and breathtaking Sahara desert, and the work of the Nomad Foundation. Film, music, appetizers, no host bar & silent auction to benefit the Nomad Foundation. And a live sampler of music from the film singer/songwriter, Ned Clark and guitarist, Bob Wright. Note: this is only for dues and general donations. A payment of $20 would be for FON dues; any amount above that would be a general donation to FON. For a printable form where you can donate to specific programs, or buy t-shirts, please go to Join FON.